Do you have damaged teeth that make it embarrassing to smile? Do you want a brighter, whiter, more attractive smile that makes you look and feel great? Now you can get a stunning new smile with straight, bright, white teeth that will get you noticed with “Smile Makeover” dentistry by Dr. Wei, Manhattan Cosmetic Dentist. Age really is just a number when it comes to Smile Makeovers. Simply wanting to have a healthier and better-looking smile is enough to qualify you as a Smile Makeover candidate, whether you’re a thriving senior or a recent graduate. The word “makeover” is used so often in pop culture that it is easy to assume the term only applies to a major overhaul of your teeth and mouth. In some cases, this will be the reality. 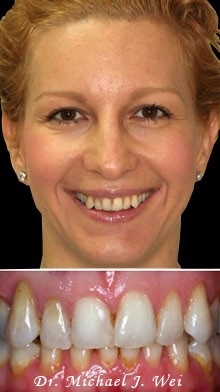 However, a Smile Makeover can be as in-depth or minimalistic as you need or wish it to be. 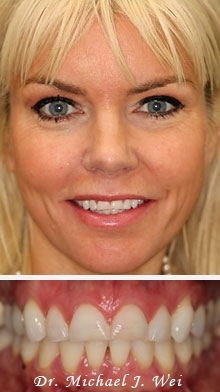 One procedure can qualify as a Smile Makeover because it dramatically alters your appearance. Professional teeth whitening, for example, can make you look like a brand new and improved version of yourself with Rembrandt Sapphire teeth whitening that makes your smile up to 10 shades whiter. Then there are the more intensive makeovers that involve restorative dentistry, such as periodontal treatment and dental implants, as well as cosmetic dentistry, like porcelain veneers. The most important takeaway is that a Smile Makeover is possible for you, no matter what kind of condition your oral health is in right now. If you are ashamed of your smile, your broken-down teeth, or any unsightly teeth or gum problems, know that your Manhattan cosmetic dentist has seen it all. What’s crucial is getting your oral health out of jeopardy and back in working order so that you have the functional and aesthetic benefits of a Smile Makeover. Once the foundation of your smile is established, any number of cosmetic and restorative dentistry repairs are possible, and they all lead to the same result: an outstanding new smile. Marcella’s old smile did not fit her vibrant personality. She always disliked her prominent canines. Her new smile improved her overall self-confidence. She now loves to smile and is happy to take pictures. We were able to give her the smile of her dreams. She said she did not realize how much her old smile had been holding her back. Now she gets compliments on her beautiful smile all the time! Daniel was concerned about the health of his teeth and uneven smile. He wanted a brand new smile because he had stained dark teeth and old crowns showed a dark line at the gums. 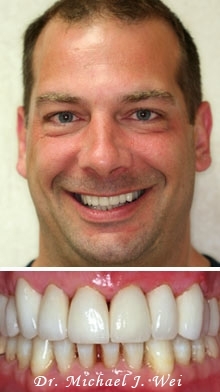 We were able to give him the straight, bright, and white smile he wanted. Angela was concerned about the health of her teeth and always disliked her discoloration of her teeth. Angela’s old smile did not fit her vibrant personality. 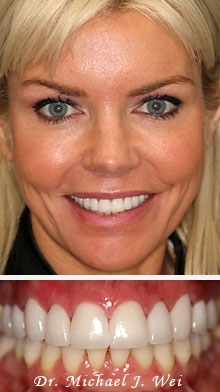 She wanted natural looking porcelain veneers. Her new smile improved her overall self-confidence. She now loves to smile and is happy to take pictures. We were able to give her the smile of her dreams. Now she gets compliments on her beautiful smile all the time! She can smile easily and loves to show her new dazzling smile. There is no need to justify your motivation for wanting a Smile Makeover, but there are plenty of reasons why people do pursue a new and improved set of teeth. Whether you want to look younger, smarter, wealthier, happier, or healthier, there is no wrong reason to pursue cosmetic dentistry or restorative dentistry. 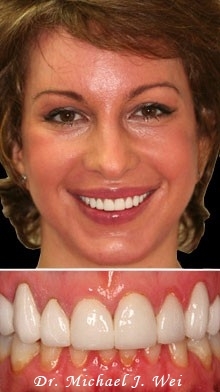 A Smile Makeover is customized to every patient’s individual needs. In the initial consultation with Dr. Wei, you will discuss your oral health history, present condition, and your goals for your Smile Makeover. A comprehensive oral exam will follow to determine what dental treatments will provide you with the smile you desire. Your makeover may begin with recommendations, if necessary, for restorative treatments to correct oral health problems and repair your smile. After agreeing on the best course of action, the Dr. Wei’s dental team will schedule convenient appointments and discuss affordable and easy payment arrangements. 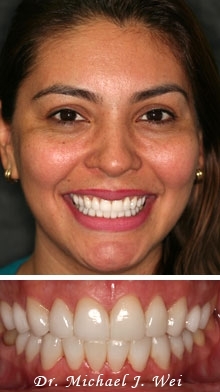 The Smile Makeover process should be easy for you from start to finish. 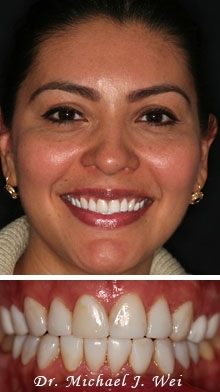 Once a patient’s teeth and gums are healthy, the most noticeable Smile Makeover work will begin. From tooth-colored fillings to porcelain tooth crowns, porcelain veneers to dental implants, a makeover consists of the procedures that are most beneficial and versatile for your oral health needs. Dr. Wei wants you to walk away from his Manhattan dental office with a comfortable smile that looks natural, but that renews your confidence and self-image. If family, friends, and acquaintances notice an improvement in your appearance but can’t quite put a finger on what’s different, be satisfied and keep on grinning – a Smile Makeover is dramatically subtle, and that’s a contradiction you want when it comes to your teeth and gums. Desire is, of course, the number one reason for pursuing a Smile Makeover. It’s also not necessary for you to know exactly what kind of cosmetic dentistry procedures you want done. 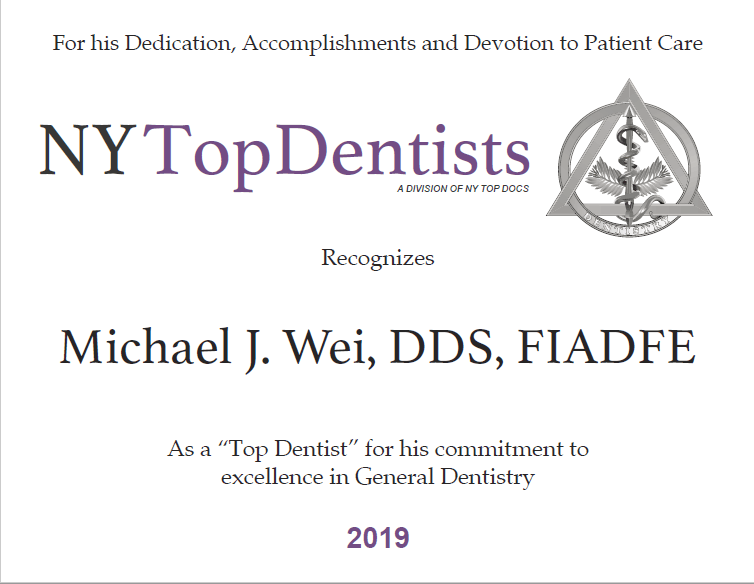 It’s Dr. Wei’s job to recognize what your teeth and gums need to look their best, and to recommend procedures that will achieve that stunning smile while staying within your budget. You were born with the DNA that will form your smile, but you didn’t ask to have crooked teeth or very noticeable gums. If you can’t live with the smile you have, then take comfort in the fact that you can do something about it. Trauma isn’t necessary to warrant a Smile Makeover. Certainly, people involved in accidents or falls must have their teeth repaired and often replaced by restorative dentistry. Simply being embarrassed by your unsightly teeth is reason enough to want a better smile. The beauty of a Smile Makeover is that it not only gives you a brand new set of teeth to show off, the procedures are carefully designed to complement your overall appearance, like the shape of your face, your skin tone, and the natural color of your teeth. Your new teeth can be shaped and sized and contoured to make you look like the best version of yourself. Whether it’s a cosmetic issue that you want to address or a corrective issue that must be managed, you may have reservations about the amount of time a Smile Makeover may take. Porcelain veneers can often be completed in just two visits. Teeth whitening takes only one visit to the dentist. Tooth inlays or onlays are non-invasive and are done quickly. Dr. Wei will take into account your availability and level of apprehension when recommending the most appropriate Smile Makeover procedures for your individual needs. 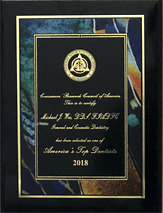 If you are anxious about being in a dentist’s chair for too long, take comfort in knowing that sedation dentistry is an option many patients take advantage of, especially if you are having several procedures completed. Sedation dentistry not only helps patients relax, it allows Dr. Wei to complete multiple procedures at once, reducing the amount of time you’re at your Manhattan dental office and speeding up the progress of your Smile Makeover. Ultimately, the Smile Makeover journey is all about you and your needs. Are you staying away from opportunities to date or fall in love because you’re ashamed of your teeth? Have you stopped speaking up at meetings or not applied for that coveted job because you’re afraid your teeth will ruin your chances? Have you spent too much time caring for others and not yourself and your teeth have fallen into disrepair? No more excuses. No more “someday.” The day for your Smile Makeover is now. Learn how you can preview your smile makeover with a digital smile design. Learn more about perfect smile makeovers from Dr. Wei. 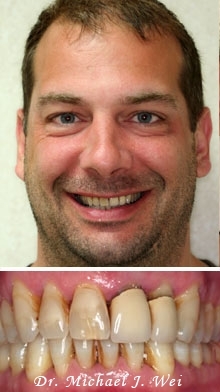 Read the latest testimonials from actual smile makeover patients. Watch videos from satisfied smile makeover patients of Dr. Wei.